GM may be beleaguered by bankruptcy, but the company is making a real effort at staying on top of auto industry trends. First the company became the first US automaker to open a battery pack factory in the U.S., and now GM is set to unveil the industry’s first smartphone application–and believe it or not, it’s pretty impressive. 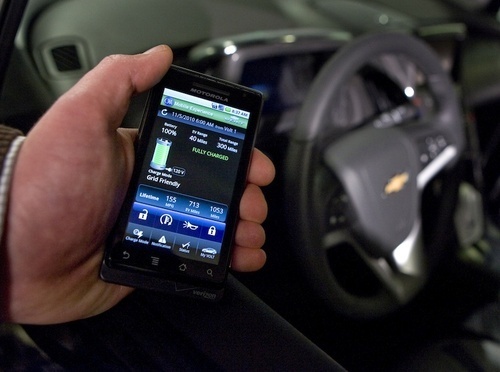 The OnStar app, which is planned for the iPhone, Blackberry Storm, and Motorola Android, would offer as much control for the Chevy Volt as anyone could expect from a cell phone. Features planned include door lock and unlock, charge status (whether the car is plugged in, percent charged, the current voltage), charge timing functions, and remote start. The all-encompassing app would also show the car’s current mpg status, odometer readings for trips and the vehicle’s lifetime, and miles traveled using pure electric power. It all sounds terribly exciting to our inner geek, but what happens if your iPhone gets stolen? In addition to having access to your email and personal information, thieves could also have full control over your vehicle. It’s a disconcerting thought. 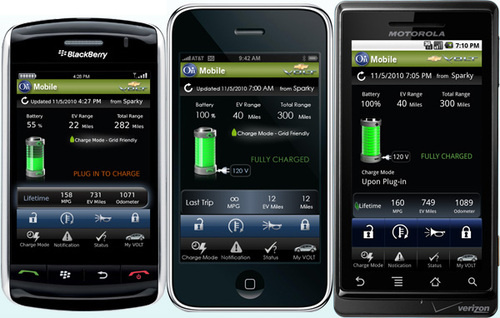 Inquiring minds can check out the app at the Volt’s OnStar Mobile Experience Web site or in the iTunes store.